In the early 1980s, Newman released a brace of solo albums which continued to push several envelopes. His second album, the perversely named provisionally entitled the singing fish, was released in 1981 and proves that Newman was more than able to work outside the traditional rock format. A collection of imaginary soundtrack pieces in the manner of Brian Eno’s Music For Films, provisionally entitled the singing fish is a diverse collection of instrumentals, encompassing the atmospheric, the abstract and the thrillingly propulsive. Now, for the first time, this album has been completely remastered and augmented with a whole disc of additional tracks, including alternate vocal versions, B-sides and demo recordings. Sounds described it as “Wonderfully cinematic”. And it’s not hard to see why. Witness the misty, ambient marshes of ‘Fish 4’, or the tripped out Morricone-esque soundscape of ‘Fish 11’. But there are moments of intensity here too. Check out the deliriously insistent krautrock of ‘Fish 7’, or ’Fish 9’, where Newman speeds up the rhythm tracks to dadaist effect. The album as a whole displays a true desire to endlessly experiment. Newman’s first self-produced set, its ambition and scope show why he would go on to become producer of choice for post punk luminaries such as Minimal Compact and Virgin Prunes. The CD-only bonus disc presents an additional 20 tracks, only five of which have previously seen the light of day. There’s a number of fascinating vocal versions of the Fish tracks, including the wide eyed ‘No Doubt’ (‘Fish 1’) and the skeletal psych of ‘You And Your Dog’ (‘Fish 11’). Meanwhile, Newman’s home recordings from the era reveal that aside from experimenting with more abstract soundscapes, he was also simultaneously developing a set of vocal songs. Of particular note are the fuzz bass driven ‘Is It Worth Repeating?’ which features one of Newman’s most relaxed vocals and the airy Canterbury Scene stylings of ‘Crystal Clear’. In contrast, the menacingly insistent ‘Vox Pop’ sees a snarling vocal riding atop waves of pulsing distorted guitars. In the late 80s, numerous artists as diverse as Barry Adamson and In The Nursery would go on to release so called imaginary soundtracks. But with 1981’s provisionally entitled the singing fish, Newman proved that, as ever, he was well ahead of the curve. 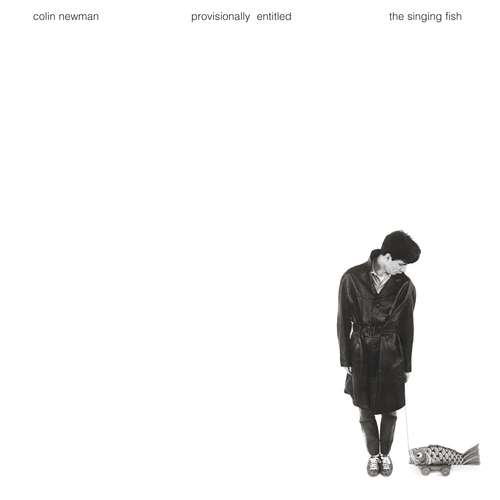 provisionally entitled the singing fish CD 1 Instruments, mouth noise, cover and production: COLIN NEWMAN. Engineering and facilitating: STEVE PARKER. Track 9 drums ROBERT GREY. Recorded and mixed at Scorpio Sound (London). Photographs by ANNETTE GREEN. provisionally entitled the singing fish CD 2 Tracks 1–4 additional recording by JOHN FRYER at Blackwing Studio (London). Track 5 recorded by STEVE PARKER at Scorpio Sound (London). Tracks 6–9 and 11–20 performed by COLIN NEWMAN. Recorded in West Norwood. Track 10 performed by DESMOND SIMMONS, ROBERT GREY, SIMON GILLHAM, COLIN NEWMAN in Rob’s basement studio in Brixton. Colin Newman - Is It Worth Repeating?